NEW YORK- A crime wave is sweeping through Williamsburg: hipsters stealing beards from Hasidic men. "It wasn't enough they stole our neighborhood, they have to take our beards, too?" laments Moishe Grinfeld, whose beard was ripped off this week. As many of Brooklyn's hipsters enter their 30s and 40s, they are desperate to still look young and edgy. The most obvious solution is to adopt the look of a conservative 60-year-old. Long, bushy beards have become so de rigeur in the hipster community that the blog, Hipster Whisper has had to run an article on the dangers of beard lice. Unfortunately, as lengthy beards take a long time to grow-- in some cases longer than the trend is likely to last-- some impatient hipsters have resorted to stealing beards right off the faces of their Hasidic neighbors. 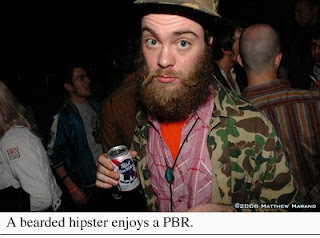 The thefts hurt both victim and perpetrator, as the newly bearded hipsters generally end up looking like douchebags. In response to the crisis, some of the Burg's trendier residents have started a facial hair drive, urging hipsters to donate unwanted handlebar mustaches and steampunk mutton chops to victims of beard theft. 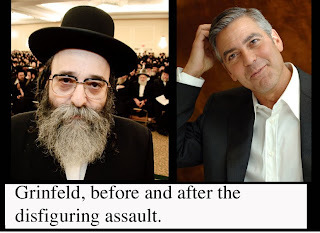 But for Grinfeld, there is no substitute for his natural beard. "Until it grows back," he kvetches, "I'm going to look like a real schmeggegie."